The best weddings are filled with love, support, and a huge round of cheers for the couple as they become husband and wife. 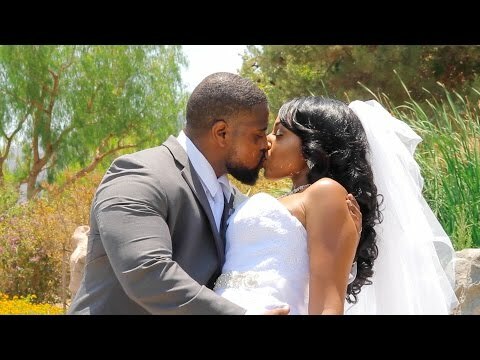 The families of Diamond and Theo definitely showed their support as they braved the heat of a Southern California summer day to witness the start of their marriage. The wedding was a perfect blend of formal and fun. Theo’s son, and Diamond’s two daughters looked absolutely adorable as the ring bearer and flower girls. Theo was dressed up sharp and proudly walked down the aisle to wait for his bride. Diamond was a beautiful sight in her strapless wedding dress. Her smile, and excitement, was contagious.In their ceremony, they made promises to love each other through both the good times, the hard times, the annoying times, and the fun times. They promised to take care of each other’s children as if they were their own, and love any new babies who would join their family. At the end of the ceremony, Theo’s grandmother gave a prayer and a blessing to the couple and their family. Once they were announced husband and wife, they jumped over a broom, in keeping with the old tradition. As soon as they landed, Theo grabbed his bride and dipped her down for a big kiss. After Family photos at the ceremony location, we took some golf carts down to the waterfall across the course for some pictures of the new couple. During the reception, everyone got their boogie on! They had fun moving to line dances and grooving with some R and B music. The first dance and parent dances were sweet and classic. Friends and family members toasted their new life together. The dinner was fine comfort food that filled and satisfied. Diamond and Theo, thank you for trusting us to capture all the memories of your special day! May you have a long and happy life together!